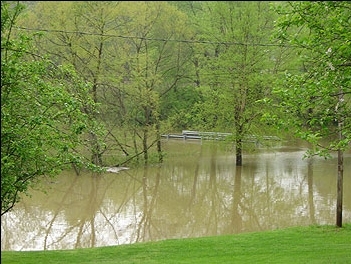 Since the beginning of time, creeks, rivers and other bodies of water have flooded their banks for a variety of reasons: steady and/or torrential rains, hurricanes, melting ice and other natural occurrences. Flash floods, caused by breaking dykes and dams are the most dangerous as there is little time for escape. Pathways, roads, and subsequently safety routes, are washed away. Modern times offer rescue crews and preparedness to save lives during disasters, but in the early years communities did not have such well-designed assistance. Cumberland, Maryland, suffered major floods in 1810 and 1840 and many other floods followed from 1852 through 1937, some covering the main streets as deep as 17 feet. 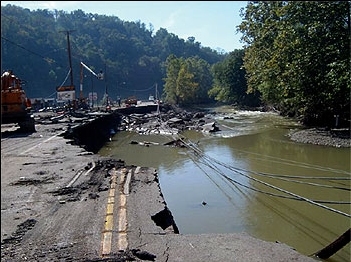 Damaged U.S. 40 washed out from 2004 Flooding near Lansing. In 1869, Brattleboro, Vermont, suffered a flash flood that rendered the Main Street under water and left in total ruins. In 1913, Franklinton, Ohio, established in 1797 on the confluence of the Scioto and Olentangy Rivers, flooded from the swollen waters. Not only were Franklinton streets under water, but also nearly 100 deaths resulted and many were left homeless. Marietta, Ohio, on the Ohio River, has seen its share of flooding from the time it was established. With downtown city streets under tons of water, the only transportation to safety is by boat. Anaheim, California, home of Disneyland, suffered a flash flood in March of 1938 when a dyke broke in the Santa Ana River after heavy rainfall. With the road no longer visible, Anaheim residents used rowboats, debris and horses in their escape to safety. But the worst tragedy is the flash flood that swept over Atwood and LaJolla, killing families as they slept. Johnstown, Pennsylvania, was struck by a flash flood in 1889 caused by a broken dam. Johnstown was nearly destroyed, and more than 2,200 people were killed. Streets were invisible under water estimated at "three stories high." Flooded valley road leading to Camp Wildcat, Kentucky, Civil War Battlefield. Guardrails, now consumed by water, mark the road. Some creeks are expected to overflow their banks in the springtime and alternate routes are established. Others are monitored closely to see if evacuation is necessary. Modern technology can determine if dams are under stress and predict when a body of water will overflow its banks. But with all our knowledge, floods still take a small death each year in the United States. In 1993, torrential rains caused levees to break on the Mississippi and Missouri Rivers flooding towns and fields, offering few roadways to safety. On a sunny spring day, a driver on an unfamiliar road may be surprised to find the road up ahead is covered with water from recent flood conditions. That is exactly what happened to us recently. We exited I-75 in Kentucky to see Wildcat Mountain and the Civil War Battlefield. Following the directions we drove down into a valley on a narrow paved road. Rounding a bend we were stunned to find that the road ended abruptly several hundred yards before us, and a river began. We were driving slowly due to the steep, curving roadway and were able to stop quickly. However, I understood at that moment how rapidly a vehicle could be washed away. Listen to the weather station before venturing out in wet weather. Avoid water-covered roads. If you cannot see the road or the line markings do not drive through the water. Water depth is difficult to determine, particularly at night, and water covering a road by only six inches deep could easily turn into two to three feet seconds later. People die every year when they try to drive across water and are swept away. Turn around and go back. Escape Route-if you live near a creek or other bodies of water, have an escape route planned. To quote the National Weather Service Southern Region, "Turn Around, Don't Drown." Special thanks for the information to David Whitworth, Area Engineer, Kentucky Division, and to Dan Dobson, Local Programs Engineer, Ohio Division for information and photographs.